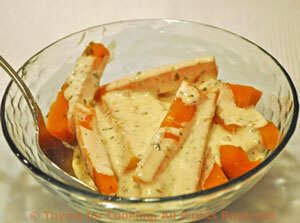 Carrots with Yogurt Cream, Thyme for Cooking simple side dish. Carrots are naturally sweet. Finished with a bit of creamy, tart yogurt gives them a fresh flavor, with a Moroccan twist. Put carrots and stock into a small saucepan or nonstick skillet. Bring to a simmer over medium heat. Reduce heat, cover and simmer until done, 10 - 15 minutes. Remove carrots from pan, add cumin, garlic and oregano to stock. Return pan to heat and reduce liquid to about 1 tbs. Add yogurt, stir well to combine, pour over carrots and serve.